Are you making any New Year’s resolutions for 2008? New Year’s resolutions are often hard to keep but my first one is easy and green: Stop drinking wine out of leaded crystal stemware. 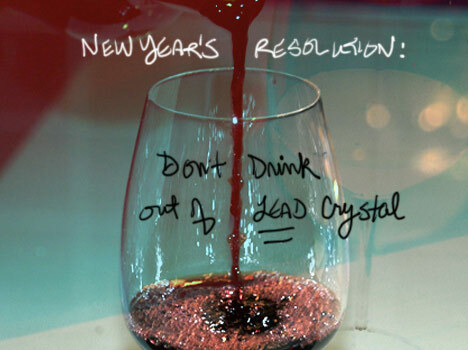 This won’t be too hard, as many of our crystal wine glasses have broken over the years. When I looked at replacing them, the fact that they contained lead made me stop and think. Is there a health risk? Is there a better alternative? If you’re not familiar with the many adverse health effects of lead check outTheFirst6Years. It focuses on the dangers to children from lead exposure in the home.. It reports that, “Lead poisoning causes subtle, yet serious, effects in children and exerts an enormous economic burden on society, costing billions of dollars in reduced IQ, lost earning potential, special education requirements, and criminal justice measures (Davies, 2005; Korfmacher, 2003; Muir & Zegarac, 2001). Does leaded crystal pose a health risk? Experts seem to agree that while the danger is small if the wine is consumed over a short space of time (such as a dinner) trace amounts of lead do leach into beverages, especially white wine, and that wine should never be stored in leaded crystal. An alternative to leaded crystal? Fenster’s natural curiosity segues nicely into my New Year’s Resolution #3: Look for innovative green products and ask questions. Don’t take manufacturer’s claims at face value! Manufacturers should be disclosing their processes and materials — so we can fairly judge whether the product is truly green and truly healthy. We don’t want to get bitten by another ‘lead bug’ twenty years down the road. But it’s up to us to get full disclosure to protect ourselves. What are your New Year’s Resolutions? Share them with me by leaving a comment. Cheers to a happy, healthy and greener 2008! Today I made the decision to stop drinking from our old lead crystal mugs (which was a free gift with purchase of Paul Sebastian mens cologne, about 20 years ago). I’ve questioned this lead glass concern before, as we’ve used these glasses daily for many years. This morning the smell and taste of lead was apparent while I was drinking an ‘Airborne’ vitamin C & herb/mineral health tab that fizzes up in water. It’s goodbye to the lead crystal mugs, as one of my new years resolutions too! Another resolution is to recycle and cut down on pollution even more than before, and encourage others to as well. Finally, to let go of those “things” around that we’ve been saving for “someday”… and giving to others who may want or actually have a need for, today. Happy endings completing year 2007 & A Healthy year of new beginnings in 2008!